We see a lot of books for potential review at January Magazine. A lot. Most often, review books arrive with minimum fanfare. A book, a press release in an envelope of a suitable size to accommodate both. Truthfully? We like it that way. We tend to note the aberrations, though. For instance, the single book that arrives in a box big enough for 10 will make us frown. (And it happens far, far more often than it should.) And the occasional book that arrives defaced (generally in ballpoint: “For review purposes only,” as though the sender were afraid and untrusting of sending the book out alone into the cruel world) will make us frown. And over-the-top press releases -- die cuts, too many pages, too much stuff -- displeases us nearly as much as books that arrive with bad press releases. What’s a bad press release? One that doesn’t describe the book in your hand, or one that offers insufficient information… or too much. It’s a difficult balance, but you know it when you see it and anything so ample it looks as though it were designed to line a marketing person’s pockets is more than enough. Then there are the gifts. In 2012, people know better than to try to win us with cars or trips, but we’ve seen far, far more than our share of chocolate over the years. Badly made stuffed toys are never a good idea, but we’ve seen lots of those, too. And what’s badly made? Something not even good enough for a child to play with… or a dog. Generally we can tell when a book is getting a really big push when we see multiple copies prior to publication. For instance, by the time the sixth copy of Justin Cronin’s The Passage rolled into our offices back in 2010, we knew that Ballantine figured they had a winner on their hands and were putting a serious push on that book. To be honest, it paid out, too. By the time the book was in stores, everyone in our offices (and most of our partners and offspring) had read the book and was talking about it. In fact, on publication day, my son updated his Twitterfeed and Facebook status with “Where were you when the lights went out?” which had been the publicity pitch that accompanied all of those ARCs out into the world. What was most interesting for us about this package was that it worked. The ARC is of the most undistinguished kind: simply printed and with a generic, temporary cover. The press release is competent, but doesn’t oversell. Three sides printed on two pages including an introduction, a bio and some review quotes. Basic stuff, professionally presented. Other than a (clearly fictional) warning about the “round multi-colored tablets” within, the drug label contains all of the important information, shared just as a real prescription label would. The title, the author’s name, the publisher, release date, ISBN and (so important!) the name and contact information for the publicist are all included, but skillfully. It’s a game we’re playing here, but a sharp one. A message is being sent about the book in a way that is both memorable and cost-effective. In the present economy it must be taxing for publicists to come up with ideas that are both original and -- let’s be honest -- cheap. The package for Taipei succeeds on both fronts. After all, how much can some bottles and a few bags of candy cost anyway? And -- bonus! -- both of those things (even together) are light and so don’t cost much to mail. Will it work? Well, it’s already started, hasn’t it? 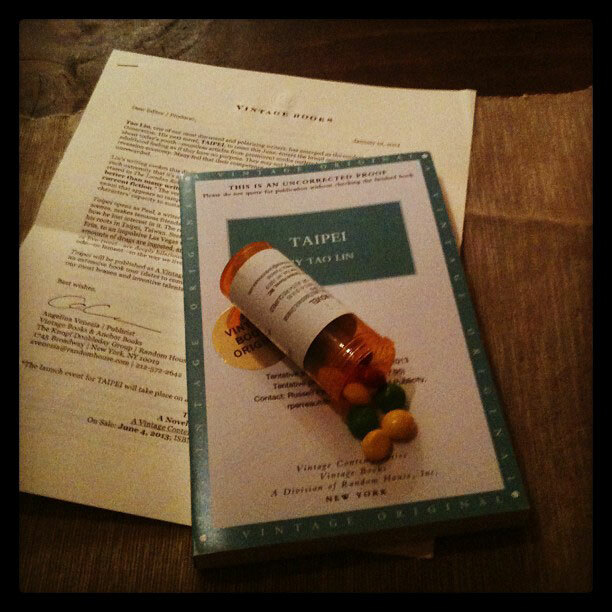 Actually, it started almost as soon as the package opened and I Instagrammed photos of the included elements for this piece… which meant my personal Twitterfeed and Facebook followers got on early glimpse of Taipei. The book will be assigned, of course. It probably would have been in any case: it’s going to be an important book and, according to the press release in my hand, Tao Lin is one of the most “brazen and inventive talents writing today.” Even so, without that pill bottle, you wouldn’t be reading me or anyone from January saying that until much closer to publication time. So, who was the creative publicist? The only "gift" I ever got was a perfumed bookmark and a mask with the Isabel Allende Zorro novel. Silly, but fun. I wish MY publishers over the years had taken so much trouble with review copies of my books.... :-( I take your point about the "review copy " stamp on the books. Honestly, what do they think we're gong to do with them? Sell them to a bookshop? Maybe a secondhand bookshop, once you've read them, but you're allowed to do that, surely? A pro reviewer get far more books than they can keep. My own review copies go into my school library, where the stamp doesn't matter. I love hearing the other side of the story. How it feels to get too much chocolate and cheap toys but also how creativity if done right does hit the mark sometimes. The problem is one always thinks one's own creative attempts are so unique and special - and probably not. I think I would love to read a whole book about different publicity packages - what worked and all the ones that didn't. That's fun too! 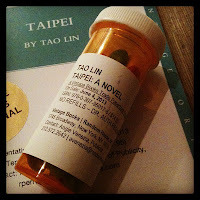 The identity of the creative publicist is no secret: click on the photo of the pill bottle and it's all there!